Lundi Fashion Boots Go Tech! Finally the ancient art of shoemaking is entering the 21st century! A brand new line of boots, “Lundi”, offers temperature control through your smart phone. Freezing outside as you walk to work or class? Turn the heat up to 80 degrees. Indoors for the rest of the day? Turn the heat down to 65 degrees. 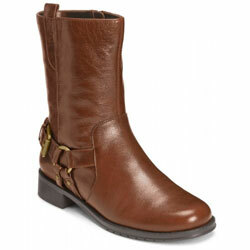 Great fashion boots for women. These boots, designed and brought to market by Katie Lefkowitz, are now being funded through Kickstarter through early May 2016. Only 1% of Women’s Shoe Brands Make Shoes for over 25% of Women! I am very certain that I am not the only woman in the world that has a size 10 1/2 shoe. Why do manufacturers not make 10 1/2 shoes? Tens are too small and 11 are like boats on my feet. How can I get a hold of any shoe manufacture to suggest that they start making them? Also my heel is very narrow and I can never fit in any shoe. Yes I can buy one of those heal add-ons but then my foot moves forward and shortens the shoe. Then my toes are very long and there is never enough space in the toe area for them. I have a nightmare trying to find shoes that fit. I love when I can wear sandals but I can’t wear them in the winter. 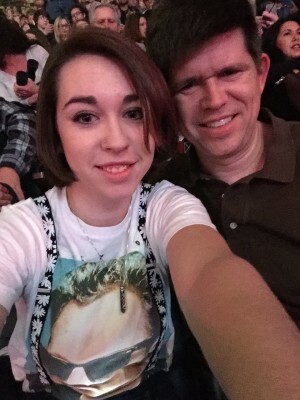 I don’t know exactly how writing this letter can help my situation but I found you on the Internet and I thought I would give you a try. Thank you very much for your consideration. Approximately 25% of all women in the USA wear shoes OVER size 10, yet fewer than 1% of all brands selling shoes in the USA actually make shoes over size 10. They say that capitalism is a great way to get products to meet market demand. But that does NOT hold true in the women’s shoe industry! I have no idea why there is such a huge mismatch between production and market need, but there is. The shoe industry folks who make these decisions still think it is 1952 and the average women’s shoe size is 6. Here are some brands that make women’s shoe size 10.5: Naturalizer, Bella Vita, Ros Hommerson, Stuart Weitzman. Find the brands that make the shoes that fit you and let them know you love them! Wide Feet at Toes – What Shoe Size Should I Buy? I have a question about a specific pair of shoes and a more general question about finding fitting shoes. I have a lot of trouble finding shoes that fit me. I have wide feet, at least at the front (the part right before the toes) and my toes. In addition to that I’m really sensitive and can’t wear anything that is the least bit tight. It can be snug but if my toes touch the shoes then I can’t wear them. I’m not sure what size my feet are as I always wear shoes that are too big as my toes get squeezed otherwise. I haven’t managed to find shoes with arch support or other support in the sole that I can wear, it’s too uncomfortable. The size I normally wear is 38-39 Danish/European size. This leads to me wearing shoes that are 1,5-3 cm too long. My left foot is smaller than my right, in my current shoes the difference is about 1 cm (right has about 2cm to the end of the shoes, the left about 3 cm, estimated) I’m a student so I can’t afford expensive shoes or to get them custom-made. Do you know of any brand that makes shoes that might fit me? Or maybe you have some suggestions as to how I can find shoes that fit me? I’m also worried it might be a problem that they’re as long as they are. I recently bought a new pair of shoes. They’re running shoes/sneaker style(not actually running shoes, just the style). As I usually have a lot of trouble finding shoes that fit so when I found these I they fit pretty well right off the bat so I hurried and bought them. I have worn them outside so I can’t exchange them. Now the problem is that the left shoe make a weird sound when I walk quickly. It doesn’t seem broken so I think it’s because it’s too long. The left shoe bends more in the front than my right, probably because my feet doesn’t reach as far in the left shoe as in the right. In the right shoe there is about 2 cm from the end of my toes to the tip of the shoe, in the left shoe it’s about 3cm. I’ve tried smaller sizes and they get too tight around the toes of my right foot(I can just feel the edges of that shoe with my toe halfway through the day so any smaller would definitely hurt). Is it a problem that my left shoe makes this noise? So far it hasn’t hurt in any way but I don’t want to risk hurting my foot. I can live with the sound if nothing bad is happening though I would love if there was some way to make it stop. I hope I didn’t misunderstand your website and you don’t actually answer such questions. I also hope that I have explained my problem in a way that makes sense as English is not my first language. So far, the only shoes that fit comfortably on my feet are Drew’s size 10W. I’ve tried other so-called wide fitting shoes…WW…but they don’t have the depth I need and I can barely squeeze my foot in let alone wear them. I’ve tried using a half size larger but then the shoes slip and rub my heels. I’m looking for flats…something that isn’t clunky like the Drew models…and I’m also looking for a low cut winter snow boot. What would you suggest…and am I able to return them from Canada if they don’t fit? Please excuse my rude delay in responding to your question. There are 28 different “fit points” on a shoe. You have discovered one that many people don’t even bother considering and that is the depth of the toe box. 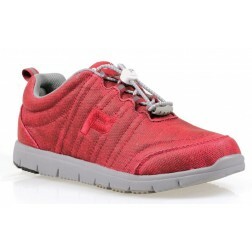 Some brands like Drew and Propet are good at making shoes for comfort and have some styles that have a deeper toe box. New Balance makes some of their athletic shoes with this feature as well. But if you want a wider range of choices, you will need to seek out styles that have a wider forefoot, like round or square toed styles, not pointed toe styles. Also, some styles have the infuriating pattern of getting shallower in the toe box as you reach the toes… just when you want that wiggle room. Women with bunions don’t need the depth but they do need a disproportionate amount of width in the forefoot area but not in the heel. You share this need. Width is designed into shoes either by increasing the width of the sole or by adding more material across the top. Either way helps you and helps women with bunions. But if the heels are too wide, you will slip out. 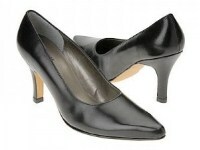 I recommend wider styles with round or square toe boxes and for flats, a mary jane style. Laceups and loafers also stay on your feet better. Ballet flats can be hard to wear. When summer comes, watch for sandals that have adjustable straps across the vamp and toe box area. Look at the Propet and Toe Warmers styles in the Booties (Ankle Boots) department, http://www.designershoes.com/shoe-styles/booties, to find something with a deeper toe box. For example, look at the Propet Weather Walker, Frost or Stowe styles and the Toe Warmers Tempt or About Town styles. Please do let me know which ones you are thinking of and I will check further for you. OH MY! This is most unfortunate! I am sorry you are in such distress. But I am confused as to why you think there are so few choices for your size 12 feet! I’d like to hear more from you about where you get your information? It is quite true that you will not find size 12 shoes in regular “brick and mortar” shoe stores, at least you won’t find more than about two or three styles. But until the shoe industry starts paying attention to the data and realize how many of you there are…. I estimate that between 4 – 5 million women in the USA wear size 12 shoes… then you must learn to find those fashion styles by shopping on line. As Sheryl Sandberg says, “lean in”. Let them hear your voice! Not sure what your taste is in shoe styles, but I’m adding an example of a red suede low heel knee high boot in size 12M, on sale for $96 from Aerosoles. It is in the “Teen Collection”. Again, Asha, you can find some great styles and not just at Payless. But you have to shop smarter than your friends. You have to shop on line. You can still enjoy going store shopping and mall shopping with them… but you’ll need to stick to socks. At least until places like Deckers wake up and discover how many of you there are! Question: Are you looking for Dressy or Casual Women’s Shoes? DesignerShoes.com fans answered this survey with a preference for CASUAL chic shoes (30%). 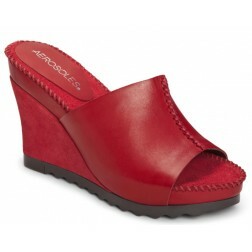 Aerosoles’ Birthright wedge heel slide in red. DRESSY with bling got 28% of the vote. Vegas by Lava brand women’s shoes. 24% of the voters were looking for “job interview” DRESSY. Only 18% of the voters wanted CASUAL comfort! Travelwalker in Coral from Propet brand. Question: What is the first shoe style you will buy for Fall? You answered PUMPS (33%); FLATS (25%); LOAFERS (11%). And all the rest were under 10% in this order of popularity: Sandals, Lace Ups, Slingbacks, Mules. Based on a DesignerShoes.com survey. Hi I like the Betty page Cheryl blue pumps and think the right size would be a 12 med width. I am 5.11 and weight 185 lbs…..do you think I could wear them? Available in size 12. Stunning. Wear like a work of art. I think the royal blue Cheryl platform pumps by Bettie Page are stunning. Having spent some time in a school of architecture, I find the metal ornamentation to be a refreshing change from the usual gew gaws one finds perched on the vamps of shoes. The color is terrific. So. I’m puzzled. Why could you not wear them? Let me think of reasons. I strongly urge you not to wear them for running, jogging or even standing for long periods. I do not think they would wear well outdoors in inclement weather. If you have a strong desire to not appear taller than a potential partner, I would advise against these, unless, of course, your partner is over 6’5″. These are showpiece shoes. Wear them like a work of art. I was wondering if you could make any brand recommendations for me. I wear an 8.5/9 and have narrow feet and long toes. I really struggle with finding brands with a long enough toe box. The last few years have been really bad as the rounded toe styles have been so popular! I find most Italian shoes are particularly short in the toe box. I am happy to see more pointy styles coming back, but even some of the new pointy styles are too short in the forefoot for me. If I go up a size then they are way to wide and my heel slips. It’s really hard to find narrow fitting shoes and even the narrow ones are sometimes not cut right for me. I often resort to boots and laced shoes as they at least stay on my feet! Any advice would be appreciated! I’ve been wanting to write on this issue for awhile! First… tell me what types of shoes you would like to be wearing and for what kind of occasions. Short answer… you have the answer. boots and lace ups. The only other style type I would add: mary jane straps. Also, you won’t find the solution by brand, only by style type. Some shoes are longer than others within a brand. But that is a fluke, not a brand policy. For example, I just bought two pair of Propet styles: a lace up (Firefly) and a mary jane. Same size. The lace up had extra space in the toes (a luxury) and the mary jane is going to be returned… my toes hit the end. I will send a longer answer soon. I am 46, but still like to wear a heel. I try to keep it 2.5 inches and under. It would be a miracle to find a comfortable pump that isn’t styled for seniors! Flats are also a problem for me- they just kill me most of the time. I think they often have shorter toe boxes. I am also somewhat flat-footed so I do need something with some structure. Very soft leather shoes are usually a bust for me. 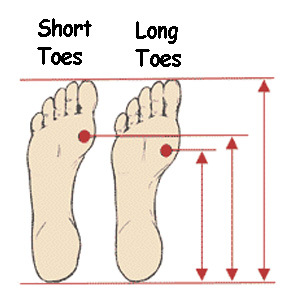 First let me explain the relationship between long toes and how shoes are sized. As my Faithful Readers know, there are 28 different “fit points” that need to be measured when making shoes. With all those fit points to consider, customers have to start overlooking some and paying attention to only the most important fit points. For most women, length is the most important. But not for you. 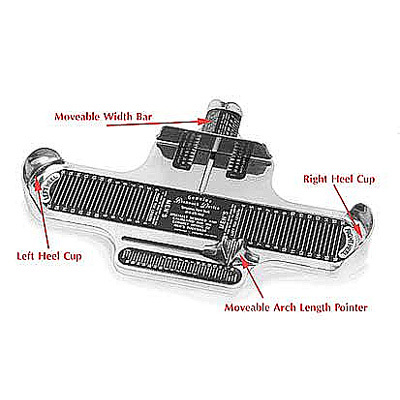 This device allows you to see what size shoe you should wear based on your “ankle length” vs. based on your “heel to toe” length. For short and long toed women, these two sizes will not be the same! Shoes are designed and manufactured assuming an average toe length. For a shoe designer, the most important measurement is the “arch length”, a somewhat misleading term that measures the distance from the back of the heel to the ball of the foot. The ball is where the foot bends when you walk. Shoes are designed to 1) curve out at that ball and 2) bend at that ball. If your toes are longer than average and if you buy shoes based on length, that curve and that bend in the shoes will never be in the right place for you! Each foot is the same length, but the BALL of the foot hits a very different place in a shoe. If you are wearing flats with a round or squared toe and a flexible sole, that curve won’t matter so much. It will matter even less if you can find shoes that have more space or depth in the toe box so you don’t have to get them wider than you really need, just so you can have the width where the ball of YOUR foot hits the side of the shoe. But if you want to wear 2.5 inch pumps, which a constructed specifically to have a built in bend at the place where average toe length feet would naturally bend, then you are in pain from the beginning. The pump will not bend where your foot bends. The arch will feel all wrong to you. The widest part of the forefoot will not hit where the widest part of YOUR foot needs the space. I’m offering an example of a pair of pumps that will allow your toes to peek out a bit. A closed toe pump usually calls for an additional 0.6 inches of space beyond the toe. If you wear open toes, you can claim that space and hopefully get the ball of your foot closer to where it should be in the design of the shoe. This peep toe D’Orsay style pump will give you some extra space for long toes.